Research leads to the conclusion that Charles Robertson was in fact Charles Robertson Steven who had changed his name in order to meet the age requirement for the New Zealand Mounted Rifles. Charles Robertson enlisted on the 13th March 1901 giving his age as 21 where it is probable that his real age was 19. The change of name was only queried on the death of Charles in 1966. On the 6th April 1901 SA 4207 Trooper Charles Robertson, SA4645 Farrier Len Retter, his younger brother SA 4644 Farrier Darcy Retter, SA 4643 Trooper John Robinson all from Johnsonville, SA4605 Lance Corporal Joseph Brown from Tawa, SA4650 Trooper George Styles from Pauatahanui and SA4657 Trooper Leo Gestro from Paremata all sailed as part of the 7th Contingent for South Africa. 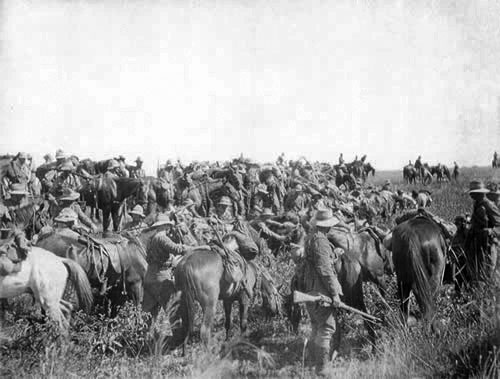 On arrival in South Africa the 7th New Zealand and the 6th Queensland Contingent were assigned to Colonel Garratt’s column operating in the Eastern Transvaal and north-east of the Orange Free State. During June 1901 there was constant skirmishing with the Boers with casualties inflicted at Blesboxspruit, Kaffir’s Spruit. In July 1901 they captured a Boer Commando at Koppjiesfontein. Also 11 Boers were killed or wounded, 25 captured along with 34 waggons, 31 carts and 1240 cattle. In late March after a year of operations, the 7th Contingent started their journey to Durban and the return to New Zealand. On the journey the 7th Contingent, at Newcastle, was addressed by the New Zealand Premier Mr Richard Seddon. The 7th Contingent sailed from Durban, South Africa on the 22nd May 1902. Charles indicated that he was returning to Johnsonville, but by 1902 he had moved to Woodville as his files indicate that the Mayor of Woodville presented the Transvaal and Orange Free clasps to go with the Kings South Africa Medal on Coronation Day 9th August 1902. In 1906 Charles Robertson was still in Woodville as he signed for the 1901 and 1902 clasps for the South Africa on the 25th October 1906. In 1905 Charles Robertson Steven married Ann Mason and they had four children, the youngest child born in 1913 was John Lunn Steven. Department accepted that the SA4207 Charles Robertson on the file was the same person as Charles Robertson Steven. Ranks Private and Trooper are used in military files and newspaper items for consistency Trooper has been used for Porirua stories. For more details on the Battle of Bothasbergat see the stories on the Retter brothers.